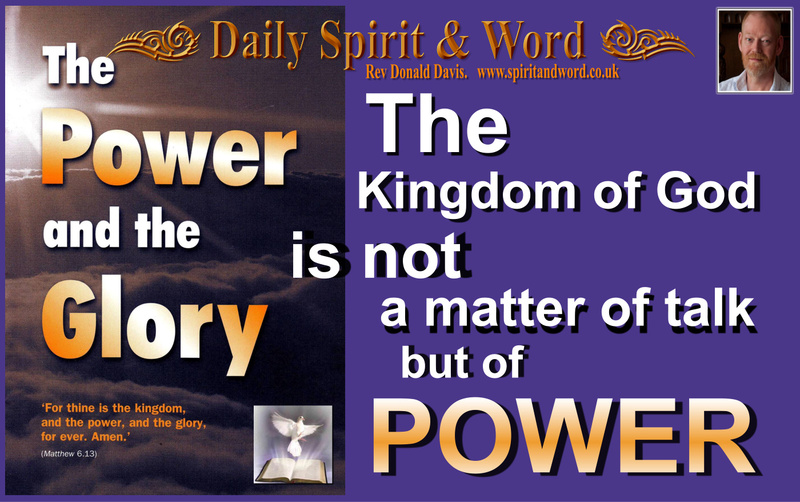 Daily Spirit & Word, 477, The Kingdom of POWER. Good morning my friends. What can I say about last night’s Gospel outreach? Just one word; “WOWzer”. Well perhaps a few more 🙂 We’ve been talking for ages about seeing the Harvest and leading people to faith and trust in the Lord Jesus Christ, well last night was truly awesome. (If you don’t read anything else, please you must read Rosa’s story at the bottom of this page). But it began in the afternoon, when I felt the Lord wanted me to go and see a man who was feeling down, depressed by a situation he was going through and confessed that he’d also contemplated taking his own life. I telephoned David, a member of our Evangelism Team, and we got together to pray for him first, before going to see him. I shared with David, that the Kingdom of God is not just about words, not just about sharing Jesus and using God’s law to bring conviction of sin and help people to come to an awareness of their need for the Saviour, but about demonstrating God’s power. So we began to pray for Bill, when we left David’s house we were buzzing. On the way to Bill’s house we met a lady called Dorothy, she was walking down Bill’s road. It was strange because we just said “good afternoon” as if about to walk past, but God had different plans, we were into a conversation about God and His Spirit almost immediately. She was talking about being a Pentecostal and how she’d died and been to Heaven. However, we sensed that she needed prayer. So we offered and tears were streaming down her face. I don’t know why God wanted us to meet up with Dorothy, but after praying and praising Jesus she exchanged telephone numbers with me, she departed with great joy. WOW! it was a power encounter. When we got to Bill’s house, there was no one in, so after leaving a Kingdom Coin 🙂 (a little coin with the Ten Commandments, we walked back down Bill’s road. When we got to the end, he turned the corner and we almost bumped into him. He smiled and we all went back to Bill’s house. After making us tea and giving us biscuits, David shared with Bill about not being overwhelmed with fears, and about how we can have real peace inside, even though there’s a storm raging. He shared how King David had that peace, but it’s a peace that’s available for everyone. When we got to praying, we sang a song first and then, initially sitting, we all stood up and prayed the Lord’s prayer. Then the power began to come, Bill was shaking and saying, “WOW” He prayed and worshiped the Lord Jesus with us. He then said, “I’m coming tonight”. David thought he was talking about Tonight’s Meal, the Lord’s Last Supper, but no, Bill was talking about coming out on the streets with us to share Jesus and the power of the Kingdom. We left Bill to get something to eat and he promised to come to church at 7.00pm. We left and then regathered at 7.00pm in the Church office last night. Soon after we arrived a man from South India came into the church, we didn’t want to stop our prayer and preparation for Evangelism, so we asked Cuthbert (think that’s his name) to join us. He came in, he was a Roman Catholic, so we got to sharing about Jesus and the Kingdom again. He didn’t want to come out on the streets so, we just prayed and it was strange, because we all hugged him and he left happy, even though we’d had some heated discussions about the doctrines of the Catholic church and Biblical Christianity. We prayed, praised and parted friends and encouraged him to check out what we had said by reading the Bible. He assured us that he would. Last Night The Kingdom Came With Power. I continued, “Rosa, we’re not here tonight, just talking about Jesus and His Kingdom, we’ve come out and God’s going to touch your life.” I don’t know what prompted me to say that so boldly, but something inside me said, “Donald my power is coming tonight”. I said, “Rosa, I’m going to put my hand on your shoulder, if you don’t mind” She nodded. Then I said, “Rosa, God’s power of love is going to touch your heart tonight, you are going to know that God is real”. She laughed, I said, “I know it sounds weird, but it’s going to happen, God wants to show you how much he loves you.”. I asked Bill to put his hand on her other shoulder and I just touched her for a few seconds. I prayed, “Lord, thank you for Rosa, we know that you love her, please come and reveal your love in Rosa’s heart right now Lord”. We took our hands off Rosa’s shoulders and I asked, “Rosa, what do you feel?”. She looked stunned for a few moments and couldn’t speak. Then she began to say, “WOW”, “WOW, what was that, my heart is literally thumping, my head’s all fuzzy, my legs have gone all shaky, I can feel some-thing’s happening in me, I feel so happy”. She began to cry and thanked us and was overjoyed. She shook my hand then let go immediately. She said, “Don’t touch me anymore, it’s too strong, oh WOW, what is that?” I said, “Rosa, it’s not me, it’s God’s love coming into your life” She said, “It’s real, I never thought this would happen, I’ll never forget this as long as I live”. After we chatted some more about what it means to be a follower of Jesus, Rosa gave us all a big hug and went away happy, she promised to read her Bible and turn to Jesus. The Power of The Kingdom. My friends as the LORD has said through Paul 1 Corinthians 4:20 “For the kingdom of God is not a matter of talk but of power.” It’s literally true. When Christians go out, even if they’re are a very young Christian like Bill was, just a few hours old as a Believer in Jesus, He’ll use us in His Kingdom power, to bring His power of love, of healing and of deliverance into the lives of others. He does this in faithfulness and in fulfilment of His promises. Signs and wonders will accompany the proclamation of the Gospel. We saw it last night, I’m looking forward to going out today to take the Kingdom of God with me. If you are a follower of the Lord Jesus Christ, then you too can experience the Power of the Kingdom at work in and through you today. He also said, “You shall do greater things” You can also be assured He’s with you for He promised that too. He also said in the Bible through Paul, 1 Corinthians 2:4-5 “My message and my preaching were not with wise and persuasive words, but with a demonstration of the Spirit’s power, 5 so that your faith might not rest on men’s wisdom, but on God’s power.” My friends, Rosa was touched, we did persuade her with the Gospel, but she also needed a demonstration of the Spirit’s Power in her life. When she got that, my friends, she was overjoyed, her faith came alive, she was touched by God and moved to praise the Living Lord Jesus Christ. Yes, you may get some people who’ll come along and join your fellowship afterwards, but it’s better by far that they are saved by Jesus Christ and know Him and that they are in His Family forever. I know that once a person is soundly saved, they’ll want to come and worship the Lord. Nothing will keep them away. Amen! You can have this same Kingdom Power at work in your life today my friends. Jesus wants to build His Kingdom. He told us to pray for that in the Lord’s Prayer: “Thy Kingdom Come, Thy will be done, on Earth as it is in Heaven” It’s happening today, well last night it did, and I’m certain that when we go out today, Jesus will be with us wherever we go, for we carry the Kingdom with us. You have the SAME Holy Spirit in you as Paul, Peter, James and all the Apostles of the Lord Jesus. Followers of Jesus are the Temple, we’re all different and God will use our various gifts, but we’re ALL called to be followers of Jesus commands to go and take the Kingdom with us. You can do it at work, as you travel to work, at home, in the office, at school, college. 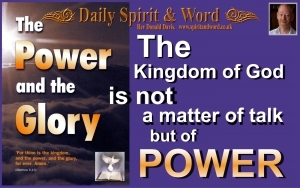 Take God’s Kingdom and the POWER and demonstrate the power of the Kingdom. Have an awesome Maundy thursday. Come and join us tonight as we celebrate The Lord’s Last Supper. I’m sure we’re going to see God’s Kingdom Power at work in and through our lives and we go out on purpose to do what Jesus commanded. Be filled with God’s Holy Spirit right now. My prayer for everyone today is that God will use you, if you’ve trusted in Jesus as Lord and Saviour. Don’t be a pew warmer who only worships on a Sunday and just soaks up God’s teaching week by week, but be active in His Kingdom, because He wants followers, disciples and new people to come into His Kingdom.